SAN ANGELO, Texas — Four suspects were arrested Wednesday by Abilene Police on charges ranging from deadly conduct, tampering with evidence and drug charges. 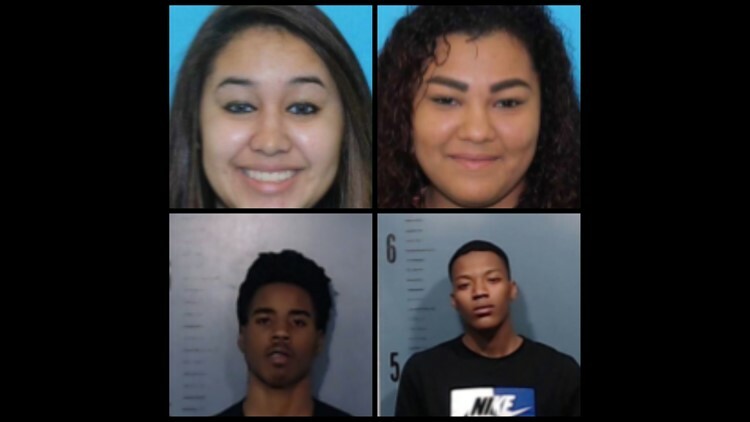 Sierra Cortez Bernal, 22; Ananda Leal, 19; Antonio Hagans, 18; and Antonio Rogers, 21, were taken into custody by Abilene Police Department detectives. According to an APD news release, at 12:16 a.m. Wednesday, police dispatch received several calls of shots fired in the 800 block of Carver Street. Police arrived to investigate and found several shell casings in the street. A home in the area was struck several times, but no injuries were reported. At 1:55 a.m. Wednesday, dispatch received several calls from homeowners in the 5100 block of Fairmont Street, which is the Stonegate Apartment complex. Callers reported hearing several gunshots. Police arrived to find shell casings from different caliber weapons. The suspects had once again fled the scene. APD said the subsequent investigation led to the identification and arrest of the four suspects for their involvement in the drive-by shootings. Bernal was charged with Class B misdemeanor possession of marijuana and third-degree felony deadly conduct. Leal was charged with third-degree felony deadly conduct. Hagans was charged with third-degree deadly conduct and Rogers was charged with Class B misdemeanor possession of marijuana; third-degree felony tampering with evidence and third-degree felony deadly conduct. Police said weapons were recovered and the investigation is ongoing with more arrests forthcoming.